It’s time to move again. And this time it’s Africa! As excited as we are about the move to a new country, actually a whole new continent and exploring its treasures; we are also sad, at the same time, about leaving India. 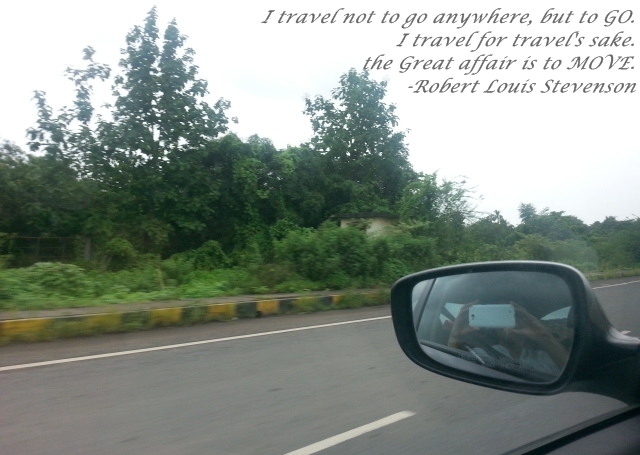 We have yet to explore so much in India itself. How do we prepare ourselves for a new place when we feel incomplete about leaving this place? [I will be writing the actual diary every night but whether it gets posted on that day or not depends entirely on availability of net connection!] Here goes Day 1! 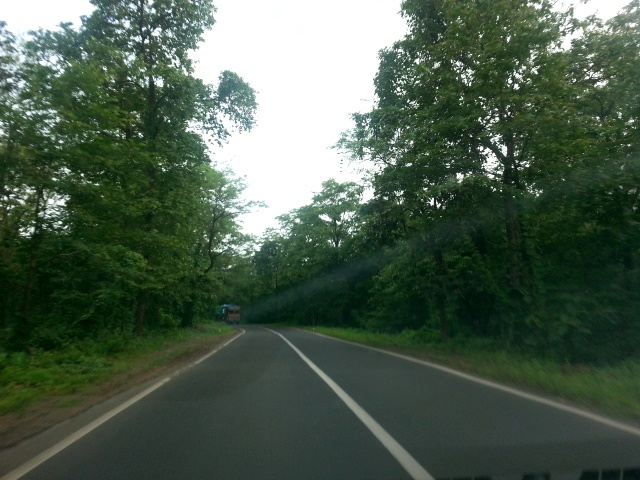 Day1 (19 August’13): Last night we came back from Ahmedabad at around midnight… So we woke up easy in the morning… Only after the morning tea and breakfast at around 10am, did we set the gears in action. At one point over tea we even contemplated of going tomorrow! [I’m glad we left it at contemplation :)]. 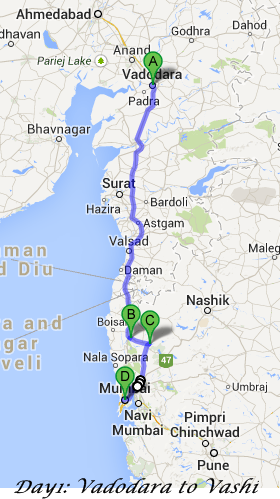 But after some very quick and a bit haphazard packing we left Baroda by 12:15pm. At one toll plaza Sikander refused to pay the toll, saying that it was nothing but potholes and he drove at 10kms/ hr speed through the entire section so he doesn’t feel that the toll is justified. And I was quite impressed when without much argument the toll operator actually let us pass giving us a “pass by exemption” :D! Awesome! We reached Bhiwandi by 5:30pm and the real ordeal started from there on. Bombay is an ocean of people! We were thinking if there was any possible way of not entering Bombay but given how the city keeps expanding the earlier bypass is now part of the city… It took us almost 3 hours to reach Panvel from Bhiwandi. By then we were pretty tired by the traffic itself and decided to call it a day. So here we are at the end of day1 at Vashi. 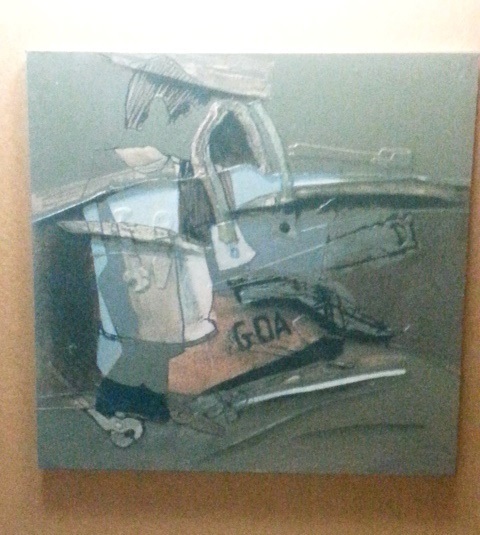 As we entered our room the canvas behind the bed had a picture which said “Goa”! Is that where the road is taking us tomorrow? We shall soon find out 🙂 Till then, Good night. Will surely do! What’s your mailing address? Hey Ashima – hope to catchya in Africa sometime ;). Have fun!! Following your untravel. Nice to meet through Omkaar,the,astronomer for living also.I want to read about your trip onwards from Washi,I don’t know how do I connect to it!I wish to say that some time a link takes you to many destinations.I got the link from one Aashish Arora,I am from Ahmedabad but have lived in Baroda for some 22 years,Malvan is known to me for Bio-culture and one Sachin Desai who had his workshop there for Bio-culture recently.May be you are in Africa now!Wish you a nice time over there.